Check out our security guard resume sample and position-specific tips to sharpen your resume and increase your odds at landing a new job. Our resume experts know what it takes to create the ideal resume for people seeking employment in the security industry. Or, if you are strapped for time, take a look at our easy-to-use resume generator to greatly simplify the process. Want to see resumes from other industries? Here’s our list of free resume samples. Not your ideal resume design? Find a resume template that’s most suitable for you. If you’re looking for more sound advice, check out our expansive cover letter collections for helpful tips. Licensed security guard with 10+ years experience working both public security and contract jobs. Excel at supervising teams and coordinating patrols. CPP and PSP certified, well-versed in security technologies and fluent in both English and Spanish. Implemented four smartphone applications that together helped reduce response time by an average of five minutes and cut guard casualties over 50%. Security guards (or “security officers” if you want to make the tone a bit more formal) are responsible for the well-being of a person, establishment or event, so it’s important that your employer sincerely trusts you. A resume profile, also known as a professional profile, is an excellent way to quickly show your worth to an employer. This single sentence shows that 1) you have a history of maturely handling money, and 2) that you can work well with people. This is a lot better than avoiding the topic of work experience altogether. A resume profile, also known as a professional profile, is an excellent way to quickly show your worth to an employer. More specifically, it can be used to efficiently convey your experience, areas of expertise, skills and achievements at the top of your resume. There are four primary components required to make a strong profile. The first part is where you give the employer a glimpse of your most relevant experience. You can start with your educational background if you are lacking in the experience department. In the second part, highlight your area of expertise or specialization within the field to which you’re applying.This is a critical piece of information because it gives a hiring manager an idea of what you as an individual can bring to the company. Depending on the job you’re applying for, security guards require different permits and certifications to be qualified. Part three is where you cover your skill-set, and any certifications you may have picked up in that field. Finally, in part four you lay down your most impressive career achievements (one or two is enough). This is a great opportunity to quantify your experience, and show how you made a positive impact on the company numbers– financially or in other ways. For a security guard this might be the size of the area you patrolled, your high success rate (at reducing crime in your jurisdiction), or how you made the work environment a safer place for your colleagues and clients. If you’re still unsure how to write a professional profile, check out our free writing guide with easy step-by-step instructions and examples. Depending on the job you’re applying for, security guards require different permits and certifications to be qualified. Research what might be necessary at the places you want to apply, and make sure you are prepared to go get the certifications you’re lacking. Depending on the state, having a firearms permit, CPR and First Aid certification plus your Physical Security Professional (PSP) and Certified Protection Professional (CPP) certifications will immediately make you a more serious candidate in the eyes of a hiring manager. It’s a lot easier to list “leadership skills” on a resume than it is to prove it with concrete information. If you can quantify your past career successes, your resume is going to rock. How can you quantify these experiences? How large (in square feet) was the property you were responsible for? How many security cameras were you responsible for keeping track of? What was the value of the property you were in charge of securing? How many criminals did you detain? How many promotions did you receive during the time you worked for your past employer? If you can answer some of the questions above and fit them into your resume, it’s going to be a huge help toward getting an interview because hiring managers love concrete details. A few numbers can go a long way. Ready to get started on your own resume? 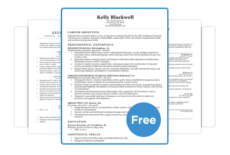 Download some of our free templates, or you can use our resume generator to create your own resume in minutes.